Tenerife is, with its 2,034 km², the most extensive island of the Canaries. In addition, the 865,071 inhabitants make it the most populated island in Spain. Two of the archipelago's principal cities are located on it: Santa Cruz de Tenerife and San Cristóbal de La Laguna (World Heritage Site). Santa Cruz de Tenerife is the capital and seat of the Parliament of Canaries and of the Government of Tenerife. Santa Cruz de Tenerife shares the status of capital of the Canaries with Las Palmas de Gran Canaria. The Teide, with its 3,718 m is the highest peak of Spain and also A World Heritage Site. This island is in the province of Santa Cruz de Tenerife. 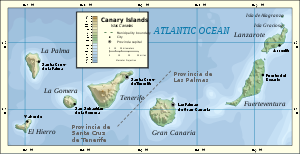 The Canary Islands are the southernmost point of the European Union despite having autonomous governments. There are daily flights from the Canaries to Moroccan tourist locations just 240 KM from the islands.